When you need reliable and high-quality facilities maintenance services in the Los Angeles metropolitan area, look to ABM! 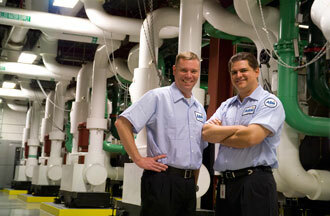 We are here to help with your Los Angeles facility services and building maintenance. We have been serving Los Angeles since 1920, offer unmatched experience and expertise in facility services, and have hundreds of satisfied clients -- including Los Angeles County Courts and US Bank Tower -- in the Los Angeles metropolitan area. As one of the largest and most trusted building maintenance companies in the Los Angeles metropolitan area, ABM offers a wide range of custom Los Angeles facility services. Our more than 6,000 certified facilities maintenance engineers keep thousands of buildings running efficiently and cost-effectively.